I know I already wrote a whole post about rooster crafts (with a few dragons thrown in for good measure) for Chinese New Year, but then I saw this cool printable and I wanted to make sure you knew about it, too. 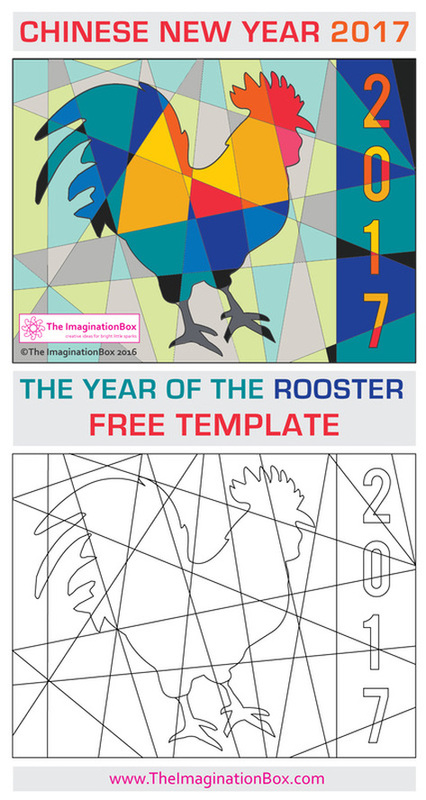 The Imagination Box has a fun rooster design that’s more for older kids to color or use as a template for other projects. This would be cool to do as a collage (maybe even an upcycled collage, where you cut out shapes from junk mail, cereal boxes, etc.). You could paint it or color it in. It sort of looks like a quilt block, so if you or your child is good at sewing, you could try that, too. She also has a great teacher bundle of Chinese New Year activities and classroom decorations, if you want to work on Chinese New Year things next week. It’s $6 on Teachers Pay Teachers.